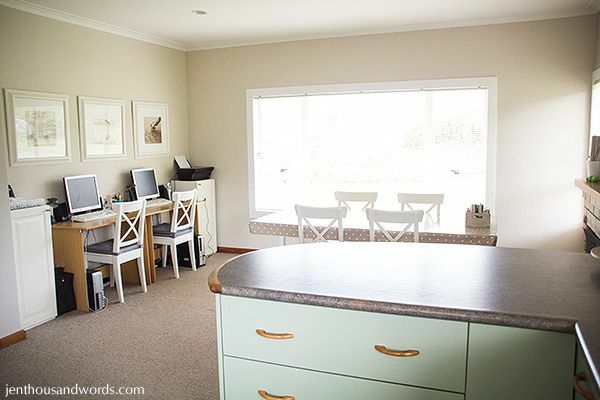 Our office area is at one end of our dining room, which is open plan onto the kitchen. We have two computers here, on two desks, with two cabinets beside them. The cabinets are tall wall cabinets from Ikea. They are resting on spare shelves but I have purchased feet, I just haven't attached them yet. I have a letter rack on the side of the cabinet on my side. 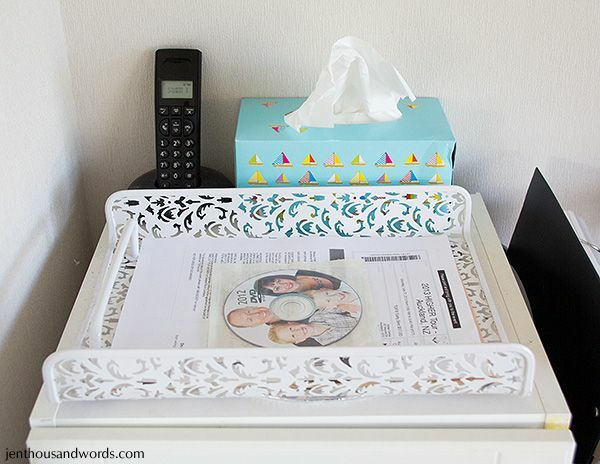 It holds a clipboard with my blog schedule and blog post ideas and notes; my recipe file; command central; and my notebook that contains my to-do list. 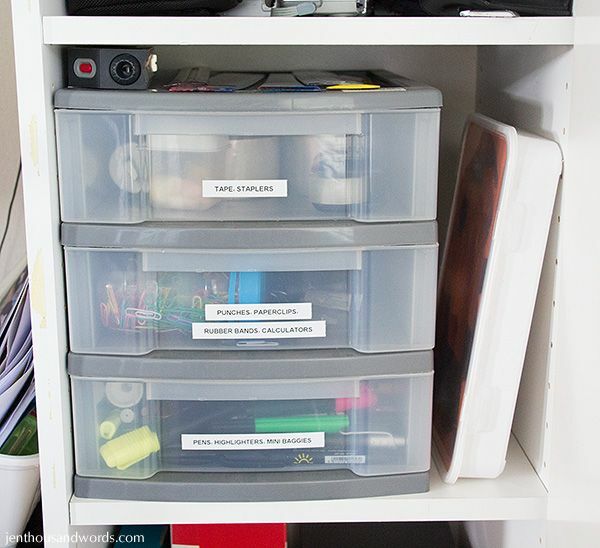 The little drawers hold push pins, little random odds and my old CF cards for my 20D camera. 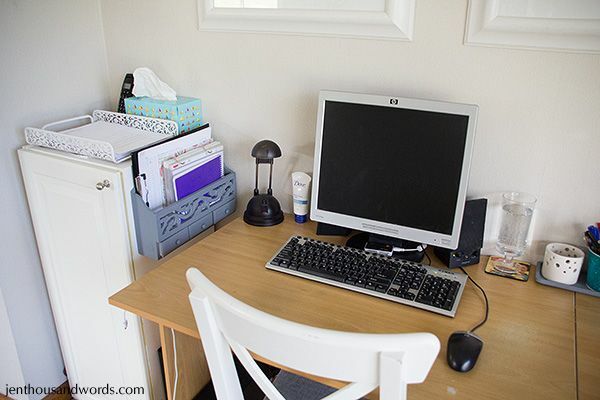 On top of the cabinet is the phone, a box of tissues and a filing tray for papers that I need to file ONLY - anything that needs to be actioned sits on my desk where it will bother me until I action it. 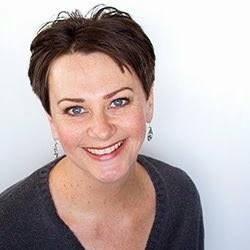 You can see the slideshow DVD that will be stuck into our 2012 Blurb book when it arrives. You can just about see (in the photo above and below) a silver cake board peeking out from underneath the filing tray - I use this as a reflector when photographing food. Inside the cabinet I have a couple of cork strips stuck inside the door for notes and random things, and the cabinet has 4 shelves. 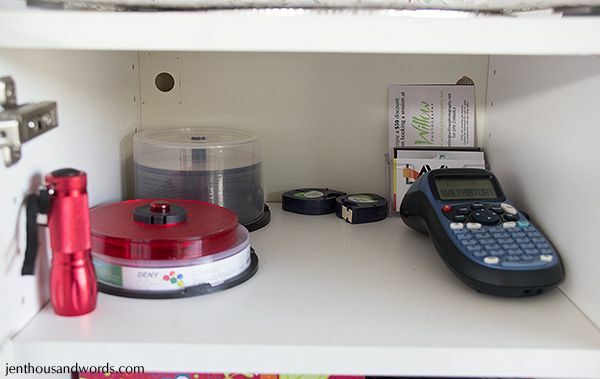 The top shelf has blank CDs and DVDs, a small torch (flashlight), a business card holder with various business cards and vouchers for my and Grant's businesses, my label maker and spare tape, and my camera usually sits in the blank space. 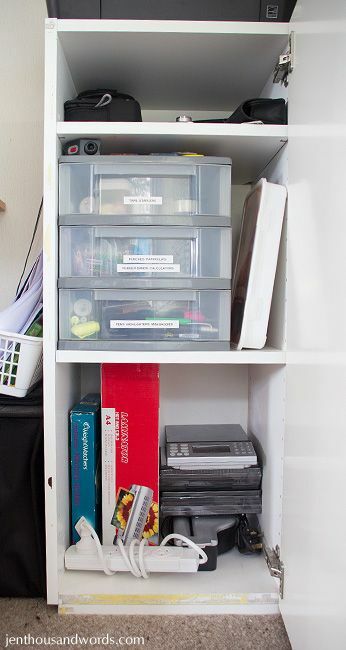 On the next shelf down are two colourful shoeboxes (one with receipts in, one with random bits and bobs like empty TicTac boxes to be used for seed storage, DVD cases, etc), my small craft mat, craft knife and metal ruler. 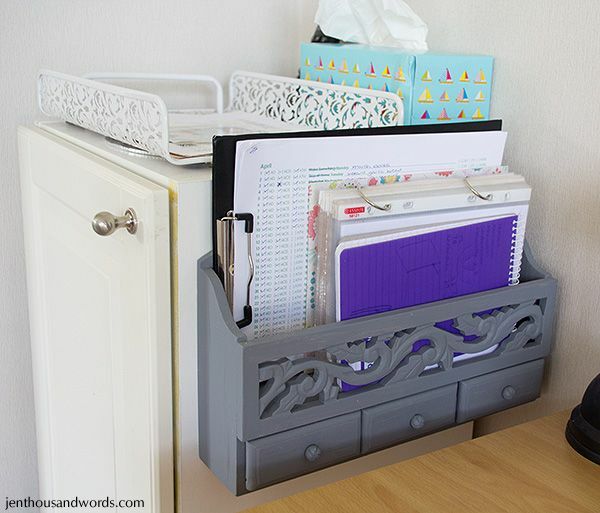 The shelf below that has another filing tray for Grant's filing. 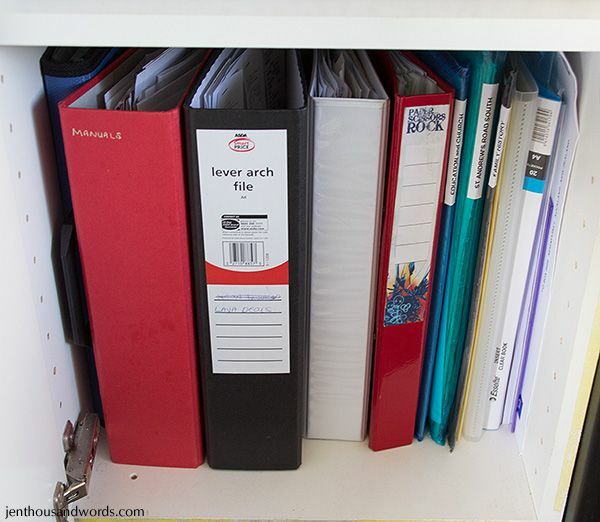 The bottom shelf has files - a ring binder of manuals, Grant's business paperwork, my business paperwork, our visitors' activities file, empty file folders, and three poly pockets containing certificates (we laminate them all), house paperwork for our house in England and family history. Moving to the other cabinet, next to Grant's desk. 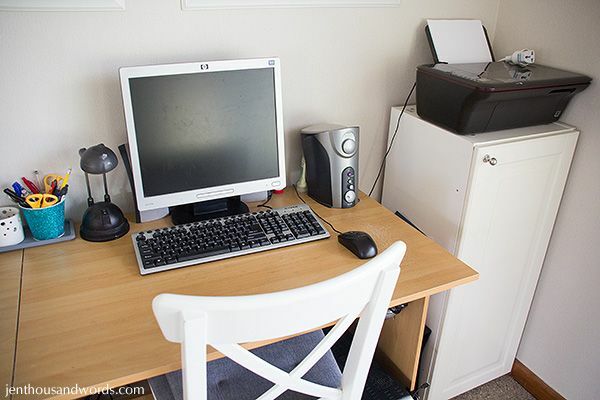 We have the printer /scanner / copier on top. 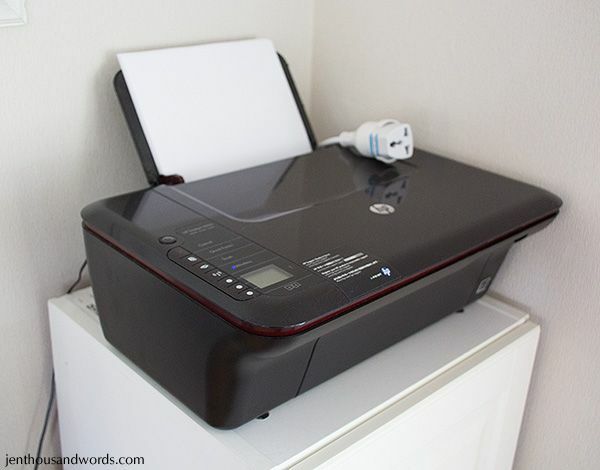 (It's an HP Deskjet 3050 in case you are interested.) You can also see the extension lead with plug adapter at the top, for charging the tablets that Grant sells. 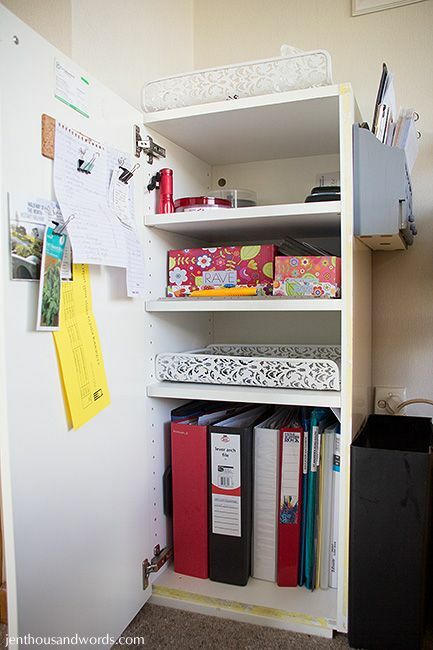 Inside the cabinet are three shelves. 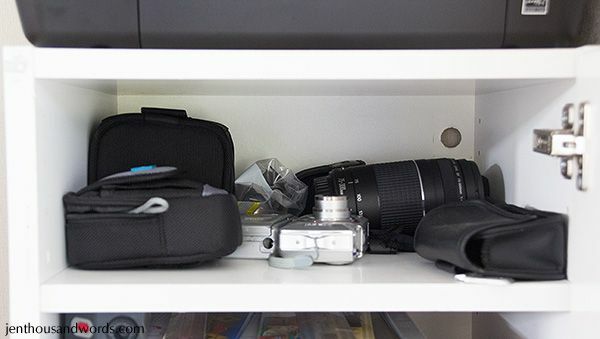 The top shelf holds camera stuff - spare lenses, my 20D body, point-and-shoot cameras, a plastic bag of cables. 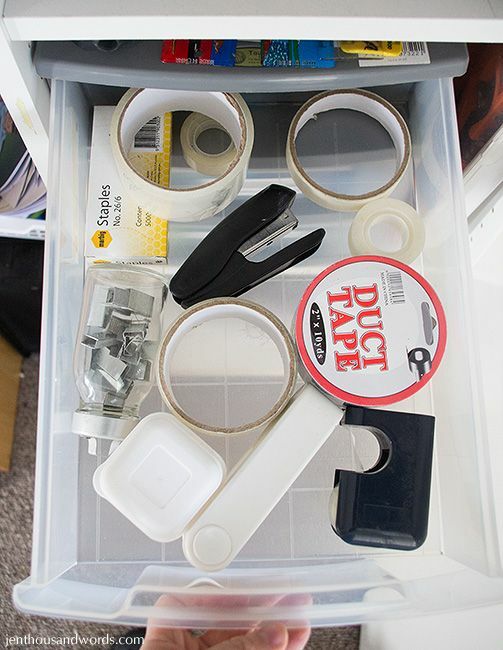 The next shelf down has a plastic drawer unit, a tool box and a tape dispenser (behind the tool box). On top of the drawers are a tape measure and a bunch of rulers. 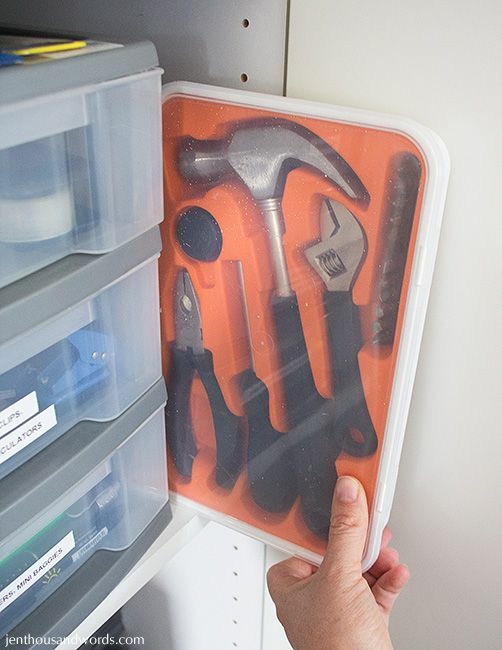 This tool kit was from Ikea and I love having the basics to hand anytime I need to do something like hang a picture or tighten a screw. 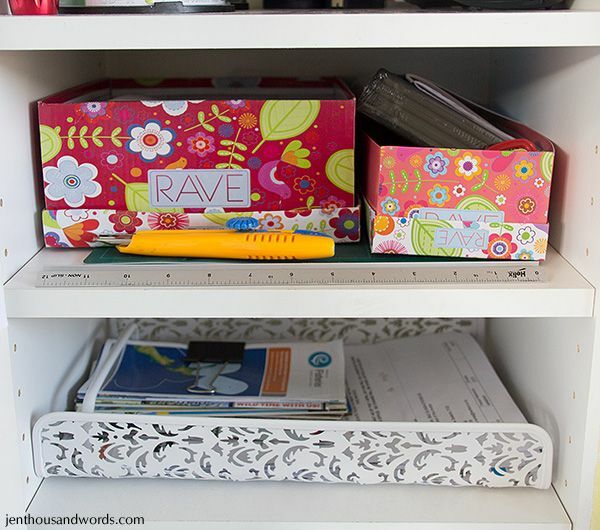 The top drawer contains tape, staplers and spare staples. 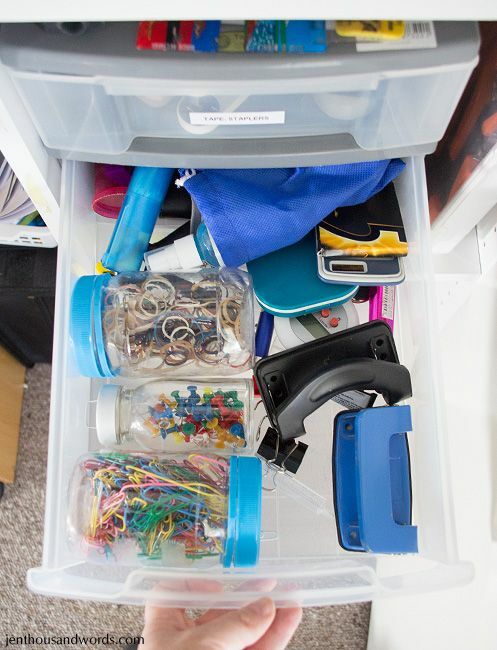 The second drawer contains push pins, rubber bands, paper clips, hole punches, calculators, and odds and ends like a lighter, gum, a timer, and a screen cleaning kit. 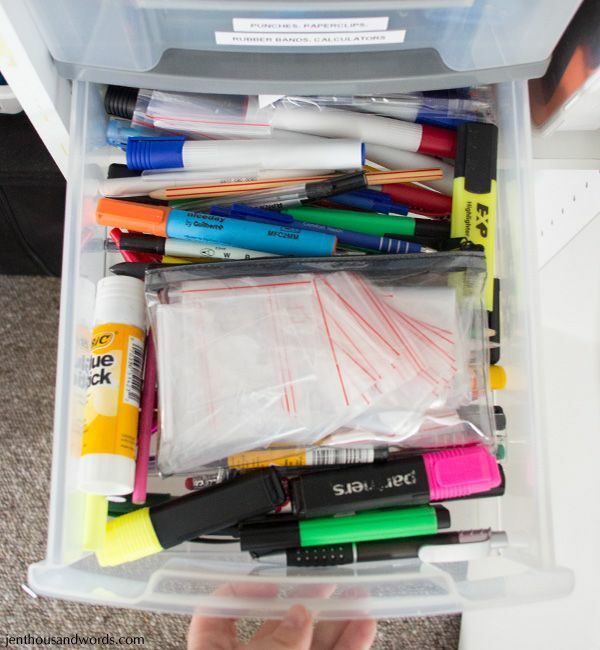 The bottom one holds pens, highlighters, pencils and glue sticks. 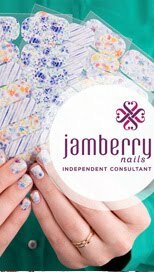 The clear pencil case holds tiny ziplock bags from the dollar store - they are useful for sending money into school for activities or sausage sizzles. I just use a permanent marker to write on the bag, noting Daniel or Noah's name and what it's for. 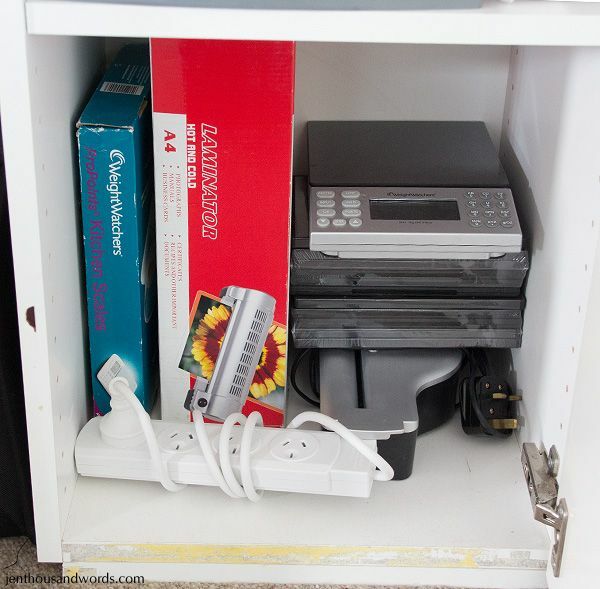 The bottom of the cabinet holds the box for my new Weight Watchers scale, the laminator, a multiplug, my old Weight Watchers scale (that Grant uses for weighing his products and ordering postage online), DVD cases, and the top of the shredder - I'll show you the bottom in a minute. Between the cabinet and Grant's desk is a massive folder which stores up to 500 disks. 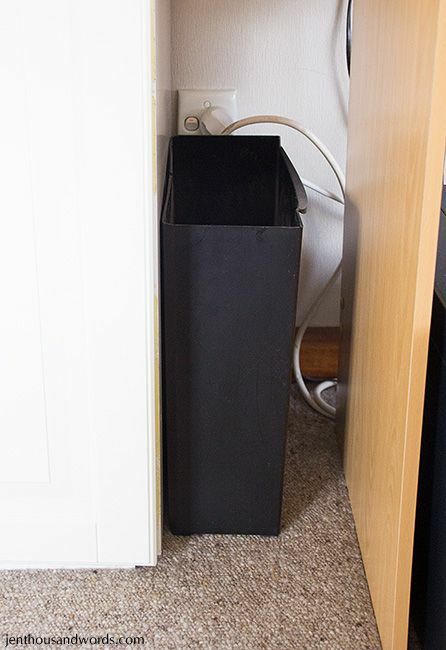 This holds our backup disks, home DVDs, and software disks. I love having it all in one place. 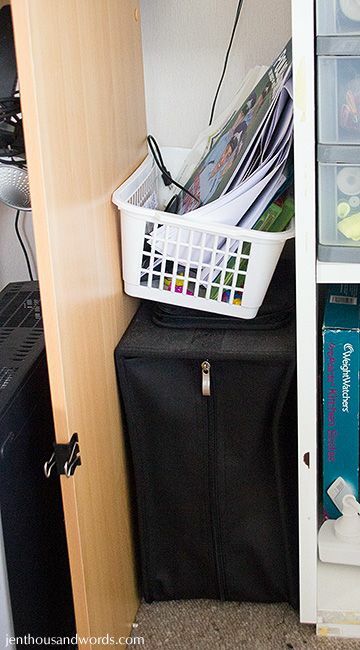 The basket contains anything Grant leaves lying around on his desk - I just chuck it in here so I don't have to see it and the desk looks clear. 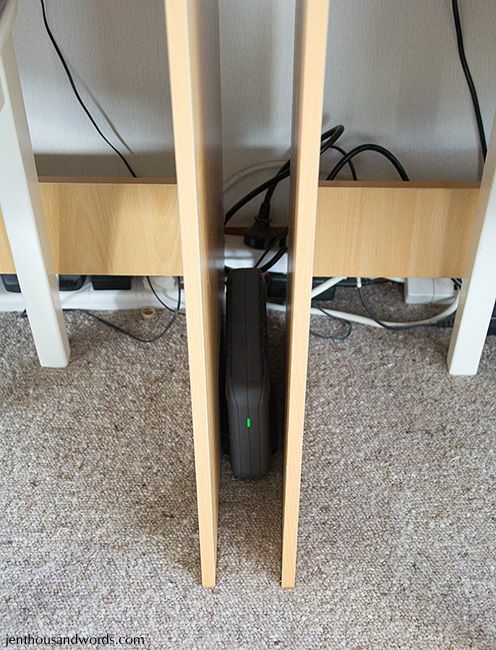 Between the two desks is an external hard drive. The cable can go either to my computer or to Grant's, depending on who needs access. Next to my desk is the bottom of the shredder - I use it as a trash can. 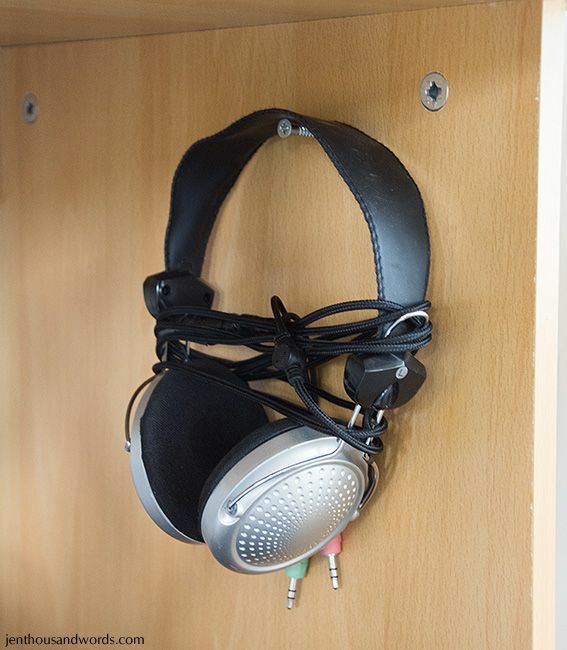 I have my headphones hung on a hook at the back underneath my desk. 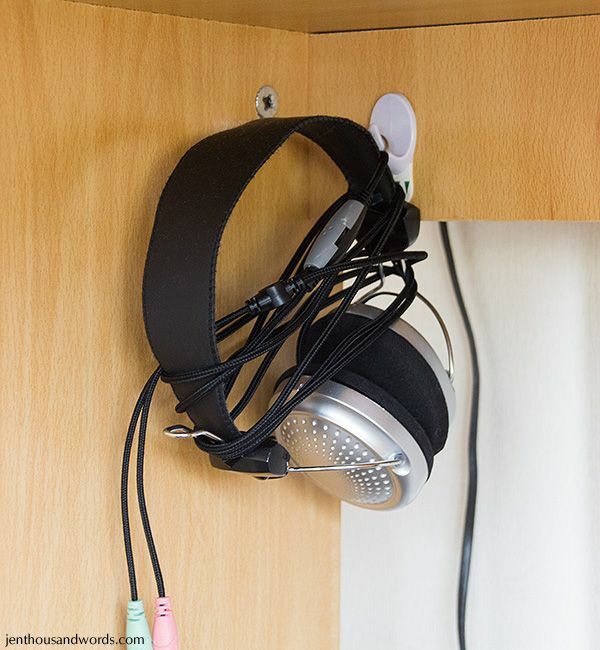 Grant prefers his closer to hand so his is hung from a screw on the side of his desk (underneath) closer to the front. 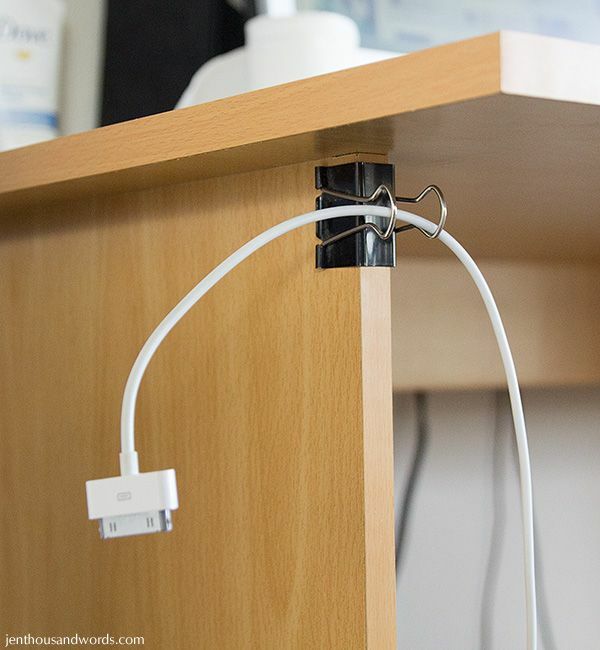 I have a binder clip holding my iPhone cable so it's handy and doesn't trail on the floor (where our computer units sit). 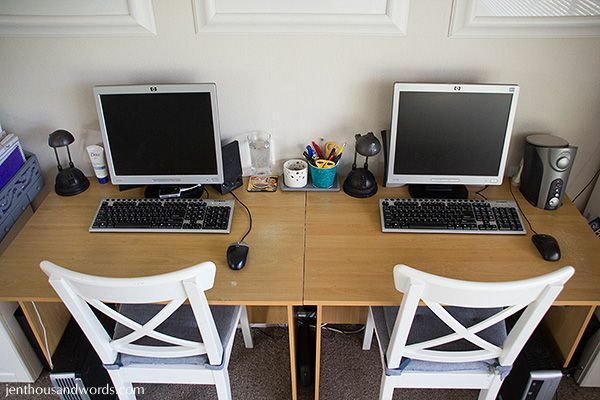 The top of our desks holds the monitors, keyboards, mice and speakers (obviously); a lamp each; a hand cream each; and the bits in the middle. 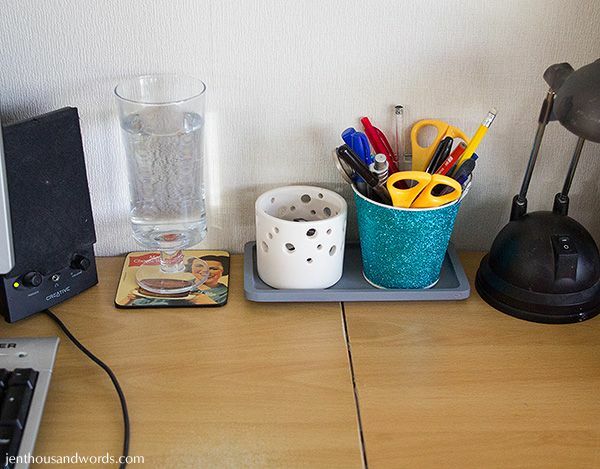 Here are the bits in the middle - a coaster with my water and a little tray with a candle holder which holds CF cards and memory sticks, and my glitter bucket with pens, pencils and scissors. How cute is my coaster? It was a gift from my friend Taryn - she knows me so well. 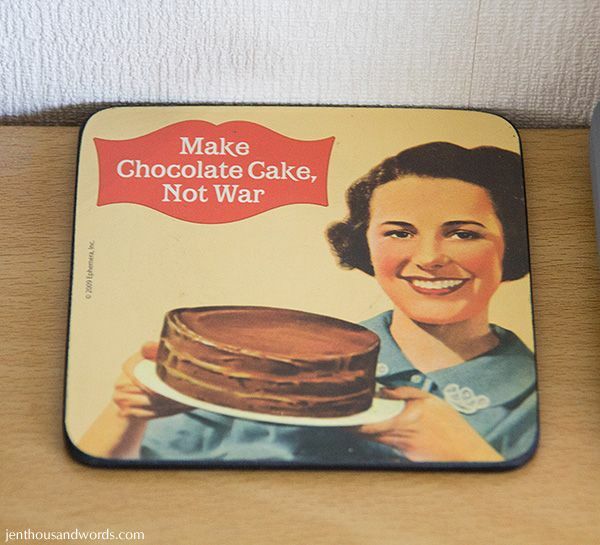 I love the sentiment and the retro feel. 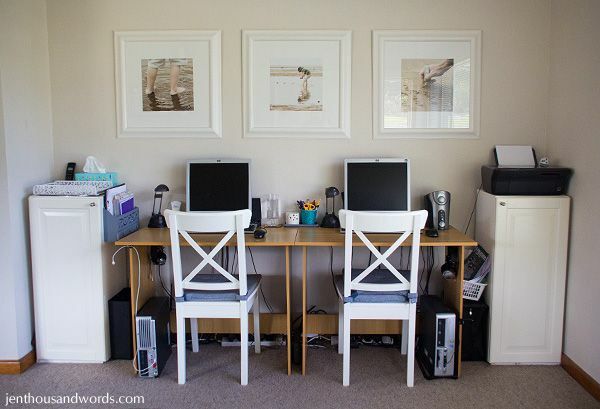 And that's how I organise our home office area. It would be great to have a separate room for an office but we really don't need it. This area works really well for us.